For over fifty years, experience, innovation, design and energy saving have been just some of the core values that have helped Indel B consolidate its position as a market leader in the hotel room refrigeration and security systems sector. On the strength of its growing success in Italy and around the world, on the fiftieth anniversary of its foundation (1967 – 2017) under the leadership of the Berloni family, the group from Sant’Agata Feltria was floated on the Milan Stock Exchange, further consolidating its image as a company deeply-rooted in the local economy and dynamic, ready to tackle the challenges of the global market and focused on achieving increasingly ambitious goals. In the world of hospitality, not only is Indel B a leader in refrigerating systems, it also offers a range of products spanning from wine coolers to safes and wall-mounted hairdryers, ideal for ensuite bathrooms and spas. 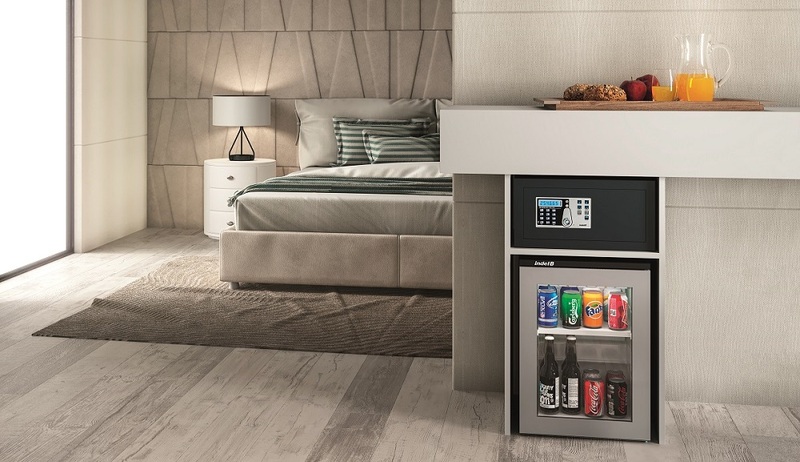 A preferential partner for leading international chains and cruise liner companies, Indel B was the first to introduce the concept of “seamless integration” between mini-bars/refrigerated coolers and furnishings, helping to dramatically improve the guest experience. Along with great design, all Indel B products boast cutting-edge functional and technical content. In fact, the range of refrigerators and compressors fitted with patented ECOSMART technology combine excellent refrigeration capacity with the lowest energy consumption in their category. An ECOSMART product guarantees energy saving of up to 77% compared to traditional hotel mini-bars and therefore, complies with the strictest European energy-saving requirements. The growing global presence of Indel B has also been built on participation in a number of top international trade fairs and events. The company is renewing this commitment in 2019 too by taking part, over the next few months, in HOFEX (Honk Kong, 7 – 10/05/2019) and then HD Expo (Las Vegas, 15 – 17/05/2019). From Nevada to the majestic Emirates, Indel B will also exhibit its range of hospitality products at The Hotel Show Dubai (17 – 19/09/2019). Fully aware of the importance of the Italian market, the company will also consolidate its historic presence at both HOST (Milan, 18 – 22/10/2019) and SIA GUEST (Rimini, 9 – 11/10/2019). By taking part in the biggest and most prestigious events dedicated to the world of hospitality, the Indel B Group has succeeded in consolidating its presence and innovative outlook worldwide. With a view to expanding its offer to hoteliers, the companies with which Indel B has shared its success and developed close partnerships are all founded on the cornerstones of innovation, a constant focus on research and development and respect for the environment. In fact, for years the Indel B Group has been committed to combining several elements in hotel rooms, which all have the same objective: the desire to satisfy any guest requirement. The company offers cutting-edge technological solutions and stands out on the Italian market thanks to its ability to innovate and always look to the future. Addressing a constantly-changing and increasingly demanding and varied target market, Indel B is proud to share its success with carefully-selected partners, like Philips. United by a single passion – innovation – the two companies have formed close ties and a global partnership, creating an unbreakable bond for many designers. In fact, Philips offers a range of televisions, featuring cutting-edge Italian design, that also double as elegant items of furniture. The constant challenge for Indel B remains the desire to combine efficient products with the need to guarantee guest satisfaction, adding a touch of charm to any holiday experience and helping to create a feeling of comfort, a key sensation for any hotel guest.